May 2009 | In the fall of 1926 Barker Brothers, then the largest furniture retailer in the United States, opened a striking new shop on the fourth floor of its eleven-story building in downtown Los Angeles. The new “store-within-a-store,” christened “Modes and Manners,” was the brainchild of the young designer Kem Weber (Fig. 2). It was not only the first outlet for modern furniture and accessories in Southern California, but also one of the first such shops in the country. “When, at some future date,” an anonymous reporter for Good Furniture Magazine wrote the following year, “the history of the American modernistic furniture movement is written, the Barker Bros. store in Los Angeles and its designer, Kem Weber, will undoubtedly be recorded as among the early leaders in its development.”1 Over the course of the next decade, Weber would work ceaselessly to promote modernism on the West Coast. His remarkable furniture would play a central role in popularizing the new movement and broadly influence California—and all of American—design of the era (see Fig. 3). Modes and Manners was a marked departure for Barker Brothers, which up to that time had exclusively featured period revival furnishings in its five stores.2 The opening of the shop came precisely at the moment when interest in the new “art moderne,” awakened by the Exposition des arts décoratifs et industriels modernes in Paris in 1925, was beginning to gain a foothold in the United States. Still, there was stalwart resistance to the new design modus; even many supporters voiced skepticism about whether the trend would last. Weber, though, was convinced not only that he could find a ready market for modernism in Southern California, but that the new design would eventually supplant period furnishings, and he worked tirelessly to make the venture a success. Like almost all the modernists in Los Angeles in the 1920s, Weber was a transplant to the city. He was born Karl Emanuel Martin Weber (in his twenties, he began using his initials as his first name) in Berlin in 1889. After serving as an apprentice cabinetmaker in his teens, he studied architecture and interior design with Bruno Paul at the School of Applied Arts (Kunstgewerbeschule) in Berlin and later worked in Paul’s architectural office. In the early summer of 1914, he traveled to San Francisco to supervise the building of the German Pavilion for the Panama-Pacific International Exposition, but when the war erupted in Europe in August, he found himself stranded in the United States. For the next several years, Weber eked out a living. He jobbed for an advertising agency in San Francisco and operated a modern design studio in Berkeley. But after the sinking of the Lusitania tipped American sentiment against Germany, Weber, facing strong prejudices and unable to find clients, was forced to work as a lumberjack in the High Sierra. Toward the war’s end, he operated a chicken farm in Los Gatos with his young wife, Erika. In 1918 they moved to Santa Barbara where Weber taught art classes and opened a small factory in an old church to produce modern and period furniture. Weber, though, found only modest success. When, in 1921, Barker Brothers, impressed with his work, offered him a position in their design department, he jumped at the opportunity. Weber spent much of the next five years churning out hundreds of designs for Spanish revival style furniture and rooms. In the quest for new sources, he persuaded the store’s managers in 1925 to allow him to undertake a buying and study trip to Spain. While in Europe that summer, he stopped in Paris to view the exposition. Seeing the exhibits of modern furniture and interiors, he became more convinced than ever that the future of American design lay in adopting the new modern style.3 After returning to Los Angeles that fall, he redoubled his efforts to introduce modernism at Barker Brothers. The store’s managers, however, were initially reluctant to embark on what they thought was a risky venture, and it was only after months of discussions and meetings that Weber was finally able to persuade them to undertake the idea. Over the course of the next year, Weber toiled in his studio—the Silver Tree—in Barker Brothers, creating scores of designs, which he turned over to the company’s draftsmen, who produced detailed working drawings. The store, which had its own production facilities, made all of the pieces, selling them not only in the downtown store but also in a new special Hollywood branch, which Weber designed. But by the end of 1927, Weber was restless. He had grown weary of having to advocate for his ideas with the store’s management, and, after long indecision, he resolved to leave the store and open an independent design studio in Los Angeles. He continued to work as a consultant for the company, however, shaping the distinctive look of its products well into the 1930s. Weber designs of the later 1920s explored new directions. In place of the frenetic forms he had experimented with in his Modes and Manners pieces, he began to rely increasingly on simple repeated geometries and attenuated shapes. An armchair he designed for the John Bissinger residence in San Francisco around 1928, for example, was at once lucid and elegant, a harbinger of the sleek and sophisticated modernism that would come to define the Hollywood of the 1930s (see Fig. 1). Weber reiterated this same language in his interiors, fusing unaffected, direct wall and floor treatments with sumptuous and refined furniture and lighting (see Fig. 10). Already apparent in his designs of the late 1920s too were indications of what would become one of his signature traits: smooth rounded surfaces and slender extended lines—the hallmarks of the coming language of streamlining. In this period Weber was also interested in finding ways of adapting his designs for mass production. Almost from the start, after setting up his new design office, he began to search out opportunities to collaborate with manufacturers, offering his services not only to design new products, but to reshape them to fit consumer requirements and demand. With the onset of the Great Depression in 1929, such efforts took on a new urgency as companies sought to entice wary buyers. Weber was especially eager to explore the possibilities of new materials and production methods, from tubular metal to the new man-made materials then beginning to appear in the marketplace. He was also interested in investigating new approaches for constructing furniture, moving away from traditional forms of joinery and support. For a time he worked on an idea for what he called “Bentlock” furniture, which relied on bent hardwood—usually hickory—with an oval “lock” of solid wood in place of dowels or mortise-and-tenon joints at places where the wood was usually joined.6 The technique produced a distinctive and novel cast for his pieces, but it proved impractical, and he eventually abandoned it. He began to look instead at using solid or glued wooden members cut in sweeping, curving shapes. For some time he had wanted to try out the idea of a chair that could be sold disassembled and readily put together by the consumer. For months in the mid-1930s, he labored on a design that could fit into a box small enough to carry home from the store. 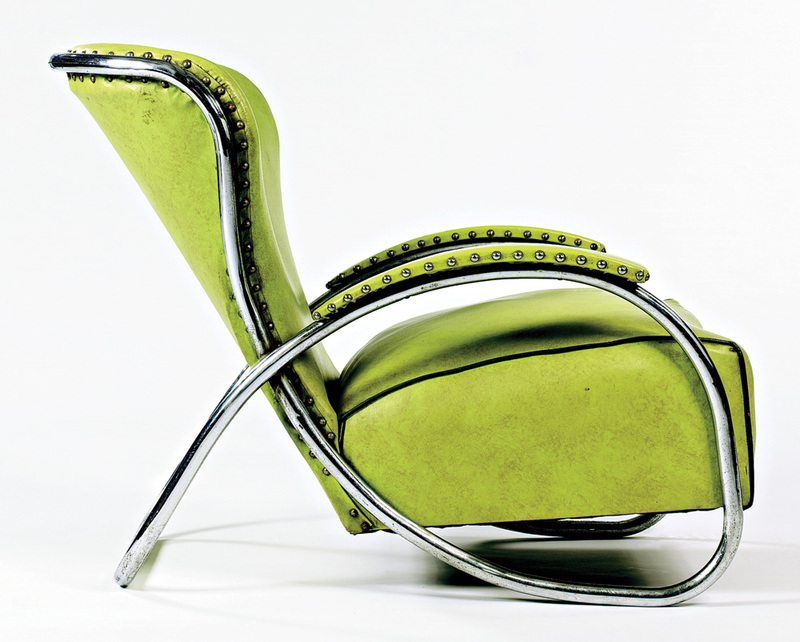 The result was his Airline Chair, which remains one of his best-known designs (Fig. 7). The chair packed flat in a box weighed seventeen pounds. Assembly, which required only a few minutes, involved slipping two rods into self-tightening hooks hung between the front and back rails.7 The chair could be adjusted from an upright back to a partially reclining position, and came with either a cloth or leather seat cover over a double pad of rubberized hair.8 It was designed to sell for $24.75, but despite the relatively modest cost Weber was never able to find a manufacturer interested in mass-producing it.9 Most of the models he had made ended up in the extensive studio complex he designed for Walt Disney in Burbank in the late 1930s. Most of Weber’s chairs and other pieces for Lloyd were priced in the $20 to $140 range, making them accessible to the broad middle-class market. But he also continued to produce custom designs for well-to-do clients. Among the most spectacular were the furnishings he created for the mansion of insurance magnate Walter Edwin Bixby Sr. in Kansas City, Missouri, in the mid-1930s. Bixby engaged the noted Kansas City architect Edward W. Tanner (1895–1974) to design a modern house and asked Weber to furnish thirteen of its rooms.13 Equipped with a generous budget, he lavished attention on the project, fashioning some of the most extraordinary American interiors of the interwar years. The individual pieces (see Figs. 8, 11, 12) displayed his penchant for bold and distinctive gestures. The sweeping contours of the desk, for example, with its pronounced horizontality, evoked the impression of the restlessness of modern business life and an unceasing striving for success—something that must have delivered a powerful message for a man of Bixby’s ambitions. In the dining table and chairs, by contrast, Weber sought to offer solace—a time of quiet after a hard day’s labors. The outbreak of World War II curtailed Weber’s design work. He tried to interest the government in a panelized construction system he had invented for defense-related housing projects, but could not secure a contract. After the war he moved back to Santa Barbara and worked mostly as an architect, building a handful of houses there and in nearby Montecito. By the late 1950s, his health began to fail and he died in 1963. Though not as well known as Rudolph M. Schindler (1887–1953) or Richard Neutra (1892–1970), the two figures who dominated the modern architectural scene in Los Angeles between the wars, Weber nonetheless occupied a pivotal role in introducing modernism to Southern California. He was instrumental not only in helping to define the special look of American modernism but also in shaping its distinctive West Coast variant. In extolling the virtues and imagery of a new, more relaxed lifestyle, freed of the stiffness and pretensions of traditional interiors, he laid the groundwork for the casual California modernism of the 1950s and 1960s. I would like to thank Kathryn Kanjo of the University Art Museum and Alexander Hauschild of the Architecture and Design Collection at the University of California, Santa Barbara; and Kurt Helfrich at the Drawings and Archives, Royal Institute of British Architects, Victoria and Albert Museum, London, for kindly assisting me with assembling information and photographs for this article. A generous grant from the Graham Foundation for Advanced Studies in the Fine Arts, Chicago, helped to support this research. 1 “Modern Furniture from Los Angeles: Barker Bros. Feature Kem Weber’s Designs,” Good Furniture Magazine, vol. 29 (November 1927), p. 233. 2 The company’s other stores were in Hollywood, Long Beach, San Diego, and Houston. See Furnishing for Public Service (Barker Brothers, Los Angeles, 1929), p. 59. 3 See Kem Weber, “Why Should the American Furniture Buyer, Manufacturer and Designer Go to Europe?,” Good Furniture Magazine, vol. 25 (November 1925), p. 261. 4 “Modern Furniture from Los Angeles: Barker Bros. Feature Kem Weber’s Designs,” pp. 233–234. 6 “New Construction Features in Kem Weber Furniture,” Retailing, Home Furnishings Edition, April 4, 1931, p. 1. 7 “Airline Chair of Wood by Kem Weber,” Architectural Record, vol. 77 (May 1935), p. 311. 8 “Wrap it Up and Take It Home!,” Retailing, Home Furnishings Edition, May 13, 1935, p. 12. 10 Lloyd Chromium Furniture, company sale catalogue (Menominee, Michigan, 1938). 11 Quoted in Carlton Cady, “Kem Weber Tells What He’s After in Modern Furniture,” Grand Rapids Herald, July 3, 1936. 13 Kurt Helfrich in Designing the Moderne: Kem Weber’s Bixby House (University Art Museum, Santa Barbara, Calif., 2000), n.p. CHRISTOPHER LONG, associate professor for architectural history and theory in the School of Architecture, University of Texas at Austin, is working on a biography of Kem Weber.